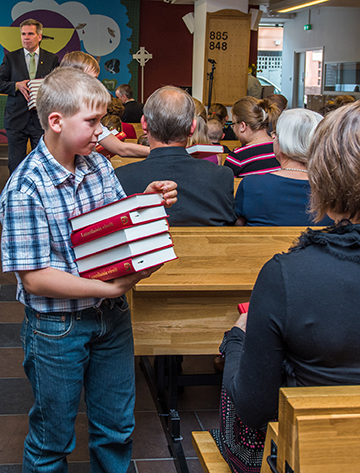 As you joyfully sing “Jesus Christ is ris’n today” this Easter, imagine your voice joining those of our Lutheran brothers and sisters in Finland, who will be worshipping using new hymnals provided by the Lutheran Heritage Foundation. Lutheran Hymns was nine years in the making. In addition to 199 new hymns (including “Jesus Christ is Ris’n Today”), the hymnal includes 150 Psalms, litanies, a large prayer section, orders for confession and absolution, and more. To further unite ELMDF’s congregations with one another and with the Church of believers everywhere, Bishop Soramies believes common hymnody and liturgies are essential.